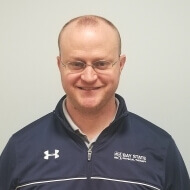 Jeff graduated from Franklin Pierce University with his Doctorate of Physical Therapy in 2015. His clinical experiences included orthopedic outpatient, inpatient, and home care PT with special interest in the pediatric population and injuries involving the lower kinetic chain. He is currently pursuing continuing education in musculoskeletal pelvic health and has an additional interest in research regarding the ways in which the musculoskeletal system interacts with the other systems of the human body. Jeff’s interest in PT and patient care has been influenced by his athletic experience as a collegiate soccer and tennis player and later by his experience as a youth soccer coach for Kings FC soccer club, based in the Metro West Area of Massachusetts. Jeff is still a soccer junkie and plays as much recreationally as he is able, and otherwise enjoys staying in shape with hiking throughout the many trails of New England.